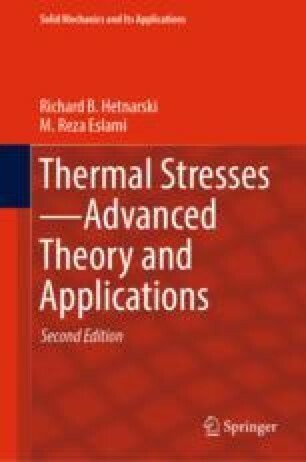 As an application of the theory of thermoelasticity, thermal stress analysis of beams based on the elementary beam theory is the objective of this chapter. It begins with the derivation of formulas for axial thermal stresses and thermal lateral deflections in beams, and the associated boundary conditions are stated, see [1, 2]. The discussion on transient thermal stresses is presented, and the analysis of beams with internal heat generation follows. The formulas for thermal stresses in a bimetallic beam are discussed. The analysis of beams of functionally graded materials under steady-state and transient temperature distributions is presented, and analysis of thermal stresses in curved beams concludes the chapter.